The Creed family—Louis, Rachel, and their children Ellie and Gage—move from Chicago to rural Ludlow, Maine, after Louis is offered a job as a doctor with the University of Maine. They befriend their elderly neighbor Jud Crandall, who takes them to an isolated pet cemetery in the forest behind the Creeds' new home. On his first day at work, Louis meets Victor Pascow, a jogger who is brought in with severe injuries from a car accident. He warns Louis about the pet cemetery before he dies, calling Louis by name despite the fact they have not previously met. 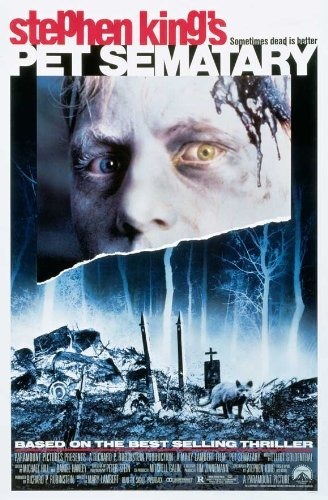 After he dies, Pascow comes to Louis in the night and leads him to the Pet Sematary, warning him not to cross the barrier because the ground beyond is "sour". Louis awakens assuming it was a dream, but notices his feet are covered in dirt. Read more on Wikipedia.